Sorry, taken off the active rentals list. Please, view our on-line catalog for alternatives. Nestled against a hill above the marina of Oyster Pond. 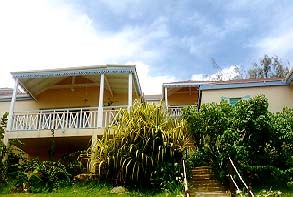 This unit is one of 5 cottages built in traditional West-Indian style. Each has their own individual entrance. 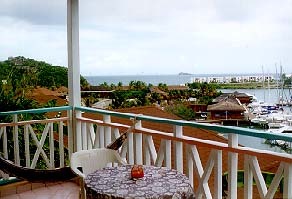 From the large private terrace you will have beautiful views over Oyster Pond and the Ocean beyond. 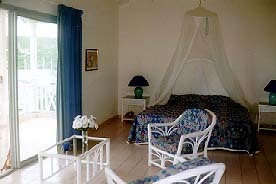 This spacious studio features air-conditioning, ceiling fan, TV and kitchenette, bathroom with shower. 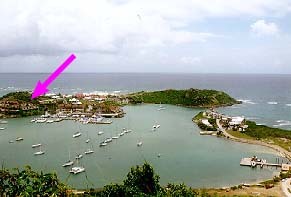 You can take a 'water-taxi' for a dollar or two from the nearby marina to Dawn Beach, on the other side of Oyster Pond.